American Pit Bull Terriers: the most honest dog breed review you'll ever find about American Pit Bull Terrier temperament, personality, and behavior. What to believe? In my experience, each of those statements has truth to it. Some American Pit Bull Terriers are indeed dangerous. They act aggressively toward humans or other animals. It may not be "their fault" in the sense that they might have inherited bad genes and/or been raised badly or abused. Yet the end result is that they're dangerous. Not the breed as a whole. But certainly some individuals. On the other hand, many Pit Bull Terriers are absolute sweethearts. So many Pit Bulls who have been poorly bred (or poorly raised or abused) never lose their trust in humans. It's enough to make you cry. The problem is that you often can't tell by looking at an individual whether he's one of the dangerous ones or one of the safe sweethearts. And of course you're reluctant to guess wrong, because of the possible consequences. So you play it safe by crossing the street. Your concern is understandable. It's sensible to recognize that there are Pit Bull Terriers still being bred for dog-fighting, or for guarding the lairs of gang bangers and drug dealers. Fortunately there are also breeders who focus on positive attributes such as intelligence, athleticism, and a keen working mind. They breed their dogs to compete in obedience trials, agility trials, or weight-pulling. American Pit Bull Terriers need at least moderate daily exercise to maintain their splendid muscle tone. You must also provide interesting activities to keep them feeling satisfied. This is not a dog to leave in the back yard with nothing to do. Pit Bulls carry themselves with an impressive, confident presence. Yet so many individuals have the soft gentle heart of a Golden Retriever and are friendly, or at least polite, with family and strangers alike. However.... attitude toward other canines is another story. Their dog-fighting ancestry dictates a strong-willed, no-nonsense kind of dog who does not take kindly to being challenged by other assertive dogs. Most Pit Bull Terriers do not start fights, but if confronted, most will readily engage. It's true that many Pit Bulls live peacefully in a house full of pets. Yet there is always the risk that dormant instincts may suddenly flare into deadly combat. As far as training goes, American Pit Bull Terriers can be stubborn. But they respond well to confident owners who know how to establish and enforce rules of expected behavior. Because of public/media prejudice, every American Pit Bull Terrier should be trained through at least basic obedience and always leashed outside of his yard. Every well-behaved Pit Bull Terrier seen on the street can help counteract anti-breed sentiment. An American Pit Bull Terrier may be right for you. An American Pit Bull Terrier may not be right for you. You can avoid some negative traits by choosing an ADULT dog from an animal shelter or rescue group. With an adult dog, you can easily see what you're getting, and plenty of adult Pit Bulls have already proven themselves not to have negative characteristics. Finally, you can avoid some negative traits by training your American Pit Bull Terrier to respect you and by following the 11-step care program in my book, 11 Things You Must Do Right To Keep Your Dog Healthy and Happy. Not knowing what you're getting. So many American Pit Bull Terriers are bred and offered for sale by people who don't have the slightest idea of how to breed good-tempered dogs who can function in our society. With this breed more than many others, it is so important to see through the hype from "macho" breeders who boast about their dogs' "massive heads" or "invincibility." Find a breeder who stresses good temperament above all else.... or else adopt an adult Pit Bull who has been thoroughly temperament-tested by an experienced rescue organization. There are plenty of these good dogs to find. Potential animal aggression. We've already touched on this. Many Pit Bull Terriers are fine with other dogs, but some are decidedly NOT. They may not start fights, but they will surely finish them. Some individuals have strong instincts to chase and seize cats and other fleeing creatures. And obviously this breed is capable of seriously injuring or killing other animals. To keep your Pit Bull in, and to keep other animals out, fences should be at least six feet high. If you have a digger, sink wire into the ground along the fence line. Gates should have the highest quality locks. Providing enough exercise and mental stimulation. American Pit Bull Terriers don't need miles of running exercise. Moderate exercise will do, as long as you provide it every day. These powerful dogs need regular opportunities to vent their energy and do interesting things. Otherwise they might become bored – which they usually express by destructive chewing. Bored Pit Bulls are famous for chewing through drywall, ripping the stuffing out of sofas, and turning your yard into a moonscape of craters. The strong temperament. The best Pit Bulls are capable of learning a great deal, but they are not pushovers to train. To teach your Pit Bull to listen to you, "Respect Training" is mandatory. 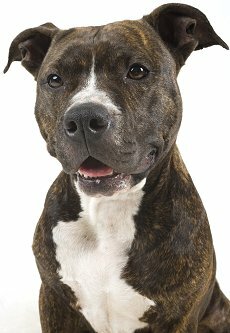 My American Pit Bull Terrier Training Page discusses the program you need. Legal liabilities. American Pit Bull Terriers are already banned in certain areas. Homeowners' insurance policies may be refused or revoked if you are discovered to own a Pit Bull Terrier. Your friends and neighbors may be very uncomfortable around this breed. In this day and age, the legal liabilities of owning any breed that looks intimidating and has a fighting heritage should be seriously considered. People are quicker to sue if such a dog does anything even remotely questionable. Frankly, most American Pit Bull Terriers are "too much dog" for the average household.